FIGURING OUT THE LIGHTNESS OF BEING! The first curated online show by our ARTWARD members. 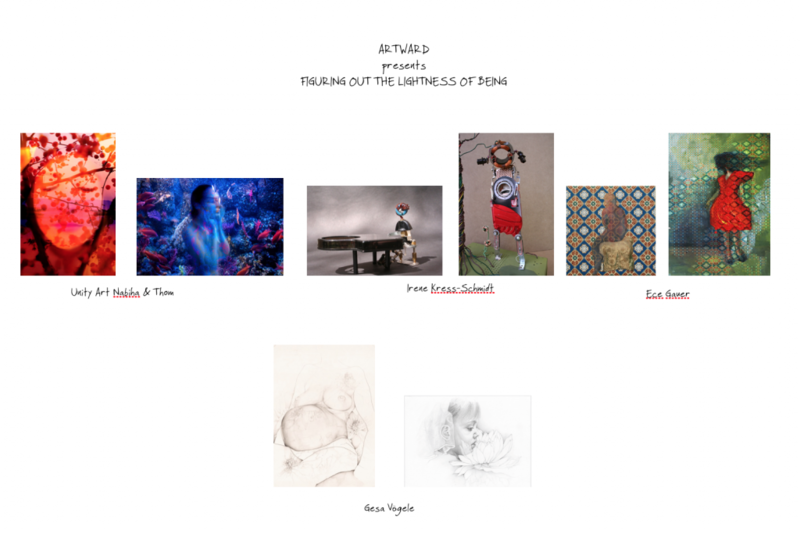 Figuring out the lightness of being; it was with this in mind that we brought together eight works by four ARTWARD members: Unity Art Nabiha&Thom, Gesa Vögele, Irene Kress-Schmidt and Ece Gauer. The imagery in the selected works is characterized by figures that glide like shadows through the picture plane, hovering, almost absent in their presence, and having the effect of seemingly being thrown back on themselves. The lightness is evident in figures that are translucent, sometimes dissolving into themselves or standing isolated, each drawn with a fine line. That this lightness – in the sense of Milan Kundera’s famous novel – can at times be unbearable is evidenced by the stances of some figures that turn away from the viewer. The figures shown in the works share an intensive physicality – in their materiality as much as in their body posture, their fragility. At the same time, a strength resides in the figures, a knowledge of the inevitable juxtaposition of lightness and weight. Kundera brings this simplified dualistic world-view into question; lightness is implicit in heaviness and vice versa, so that these two poles are not so far removed from one another as one might first expect. The ambiguity, to which Kundera refers, and the secret surrounding lightness and heaviness can be found in the works of our artists. Gesa Vögele repeatedly investigates the antonymous traits of femininity in her work, which she states as containing both subtlety and strength. This characteristic is also mirrored in the aesthetic of her drawings from the flower series, two of which, Clematis and Water Lilly, are shown here. Irene Kress Schmidt’s figures, whose bodies are assembled from pieces of metal, copper wire and screws, relate to a man-machine discourse, which negotiates the terms of the relationship between the body and new technology. The facelessness of the forms leads the viewer to contemplate the isolation to which these hybrid beings are subjected. The traces, however, that are left behind in the landscape by the women in the works of Unity Art Nabiha & Thom, speak of a meditative introversion, from which strength is generated; while the ghostly shadows in Ece Gauer’s works flash like moments from memory, which could be both light and heavy. As we look from the perspective of an exploration of lightness and heaviness at these eight very different works we see that the perspectives of the artists are anything but simple; far more, they give form to the ambiguity asserted by Kundera and the mystery that exists within these contrasts.